The recent throw-back marketing decision by an airline brought back a flood of memories stretching back over nearly six decades to when I was about the age my grandsons are now. When I took my first commercial airplane flight at age 19, it was cross country in 1967 aboard a United Airlines Boeing 707. United was in the first year or so of its iconic “Fly The Friendly Skies” ad campaign, launched just six years after it had first began jet service. It was a campaign designed by Leo Burnett to replace the airline’s “Mainliner” series. Burnett’s firm had already created many campaigns that have survived since the 1950s including Green Giant, Pillsbury Dough Boy, Charlie the Tuna and the Marlboro Man. Now United wants to bring "Friendly Skies” back. Fortunately, the company didn’t try to mash it up with an old Continental Airlines ad like they did with logos after the merger, which by many measures, including destinations served, makes it now the largest airline in the world. But it isn’t its advertising that’s the problem today, it is advertising in general. Now inundated with what experts estimate will soon be more than 10,000 ads per day, it just isn’t as effective as it once was and the average person has just tuned out. “Friendly Skies” revolutionized airline marketing nearly five decades ago but back then there were only three channels. Cable was just an experiment and advertising worked if a business could just power enough resources into it as United did back then. Key, of course, is there were also only three other competitors to United. United’s problem today is that it lost sight of its story along the way and not just the one they conveyed in advertising. Back when it first began running those “Friendly Skies” ads, Dr. Stanley Plog was not only conducting research that rescued the tanking political career of Ronald Reagan in 1966, he was rescuing air travel. In 1967, as I took my first commercial flight, airlines were introducing jets and seating capacity was swelling by 20% while the percentage of passengers flying was growing by only 8%. To help, Plog developed a groundbreaking classification of visitors that with just 15 questions could be used to identify those who would be most likely to fly. It was far more revolutionary to marketing than the “Fly The Friendly Skies” ads. In fact, it was used to calibrate and target those ads. He ranked visitors along a bell curve of six classifications with pycho-centric (laid back, casual, authentic) at one end and allocentric (adventurous) at the other. Actually, the quiz, still in use, classifies me as a “mid-venturer,” noting this classification is drawn to technology and history. In my mind though, I fall more toward the psycho-centric end of the curve. Give me a lakeshore, a dozen books on my reader, some close friends and family and a few good restaurants nearby and I’m in heaven. But I guess my cross-country ventures with Mugsy, my bulldog, qualify me to move me up the continuum a bit toward allocentric. Later Plog evolved his classifications into a tool that helped forecast destination lifecycles, also something I found very useful in the three cities I marketed over my career. What this hammers home is that storydoing is far more important than storytelling and it isn’t about clever or even nostalgic advertising. In mid-2009, a few months before I retired from four decades in community visitor-centric economic and cultural development, United’s story was overwritten by a video now seen by an astonishing 14 million viewers. United Airlines broke singer-songwriter Dave Carroll’s prized Taylor Guitar. When numerous employees seemed less than empathetic, Carroll, a gifted storyteller, wrote and recorded the song United Breaks Guitars, a song that I admit is not only effective, but on my playlist because, well, it’s a great song. Those employees and ultimately executives at United, through negative storydoing, did more damage than advertising could ever remedy even in its heyday. Advertising is superficial and can never cover over systemic flaws in a company’s story. The “storydoing” challenge faced by airlines in general isn’t just about guitars. A new study shows that one in five travelers are prevented from fulfilling trips by airline delays and cancellations. Advertising, even back before it dipped well into a negative return on investment, lacked creditability because as prolific author Seth Godin often writes, it is a form of "yelling” at consumers and the message is really just the advertiser talking about themselves. It just costs too much to “yell” that loud these days and there are far more effective and efficient ways of marketing, such as “storydoing.” The “Friendly Skies” campaign was no doubt motivated in part because airline travel wasn’t so friendly in my early years. When I was eight years old, to collect on her life insurance a guy put a bomb in his mother’s luggage aboard a United flight as she headed to Alaska. When detonated, it killed everyone flying aboard the DC-6B flying on the segment between Denver and Portland. 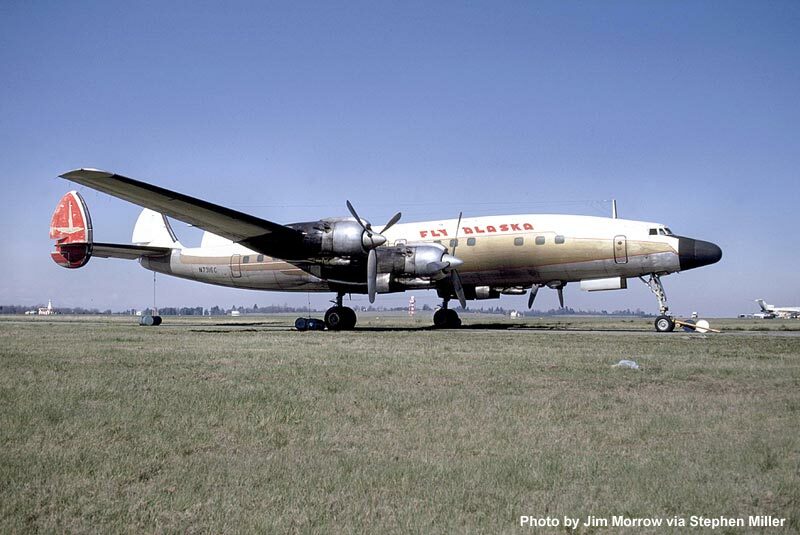 A week before I turned nine years old, a United flight struck a TWA Lockheed Super Constellation at high altitude over the Grand Canyon resulting in another 128 tragic fatalities. This led the following year to federal government development of the current aircraft control system. It included deployment of a common navigational aid for both military and civilian aircraft called VORTAC, which had been developed by government research. For the first time it gave airline pilots the ability to detect aircraft flying nearby by means other than by just looking out the window. It was also the Grand Canyon tragedy that led United to become the first airline to purchase flight simulators for training pilots. Ever since the 1930s, United has had “big” in its DNA. It was formed in 1934 when the federal government broke up the monopoly that had been established by Bill Boeing and Frederick Whitney in 1929 called the United Aircraft and Transport Company. It was divided into Boeing Airplane Company, United Aircraft and United Airlines in the west and companies such as Pratt & Whitney Aircraft Company in the east. Bill Boeing walked away from the business and developed many of the historic neighborhood immediately surrounding downtown Seattle. Like Boeing, United had its roots in the Pacific Northwest, having been founded by Walter T. Varney who flew mail routes in the 1920s that stopped in my native state of Idaho. Varney, a California native who was also the founder of Continental Airlines, now merged with United, passed away the year of my first airline trip. While I was in college, United Airlines was headed by Eddie Carlson, another native of the Pacific Northwest who had begun his career in tourism as a bellhop while working his way through college at the University of Washington. By 1960, after serving in the Navy during WWII, Carlson rose to president of Western International Hotels, which owned and managed a chain of hotels throughout the northwest. He famously sketched the idea for Seattle’s Space Needle on a napkin. By the time I was midway through college, the hotel chain merged with United Airlines and Carlson added president of that airline to his bellhop resume. I met him during Spokane’s Expo ‘74 and Carlson still had the graciousness of a good bellhop. By the time I was marketing Anchorage, Western International Hotels was renamed Westin Hotels in 1980, an abbreviation of WESTern and INternational. Carlson was an inspiration to many of us in community-destination marketing but I realize now that he was the last of an era when hotels and airlines still understood that destinations are the real reason people travel and use their services. Airlines, in particular, used to be much more about destinations than mere transportation. During the first two decades of my career in community-destination marketing, airlines used to help helped us develop destination brands and tour products for the cities they served. Early in the 1980s, an airline friend of mine who served on my board of directors, asked me to accompany him on a 1200-mile round-daytrip from Anchorage to Kotzebue, an Inupiat village on tiny gravel spit pointing out into a namesake sound of the Arctic Ocean. It was my first visit above the Arctic Circle. In addition to meeting new friends John Schaeffer and Willie Hensley, I took a snow-machine ride out to see Reindeer herds established there in the 1800s and visited the then new Museum of the Arctic, which has now been incorporated into the new Northwest Arctic Heritage Center. John was then mayor and soon-to-be head of the NANA Regional Corporation headquartered there. Willie was already famous to me from my reading of a segment of Coming Into The Country still a classic by John McPhee. As we landed, made our way around the village and then returned to the airport midway down the spit, I caught many glances of the hulk of an Alaska Airlines L-1049H Constellation (aka “Connie”) the same type of aircraft that had collided over Grand Canyon. Alaska Airlines today is a leader in safety, performance and technological innovation. It was being brilliantly marketed during my time in Alaska by Dave Palmer, a friend who is now also retired and who collaborated with me on a signature inflight research project that revolutionized how we marketed Anchorage. The carcass of the old “Connie” left in Kotzebue was back during a rough patch for the company, probably when one of the airline’s pilots is famously said to have had to personally pay to refuel a plane because the airline had not paid its bills. Flying the Constellation was itself a form of marketing pioneered by Howard Hughes. This distinctive aircraft had been his brainchild when he owned TWA and was distinctive because of its unique tail and the humpback shape of its fuselage. However, the Constellation was brought to reality by Lockheed, a company evolved by Walter T. Varney who was also the founder of United and Continental airlines. 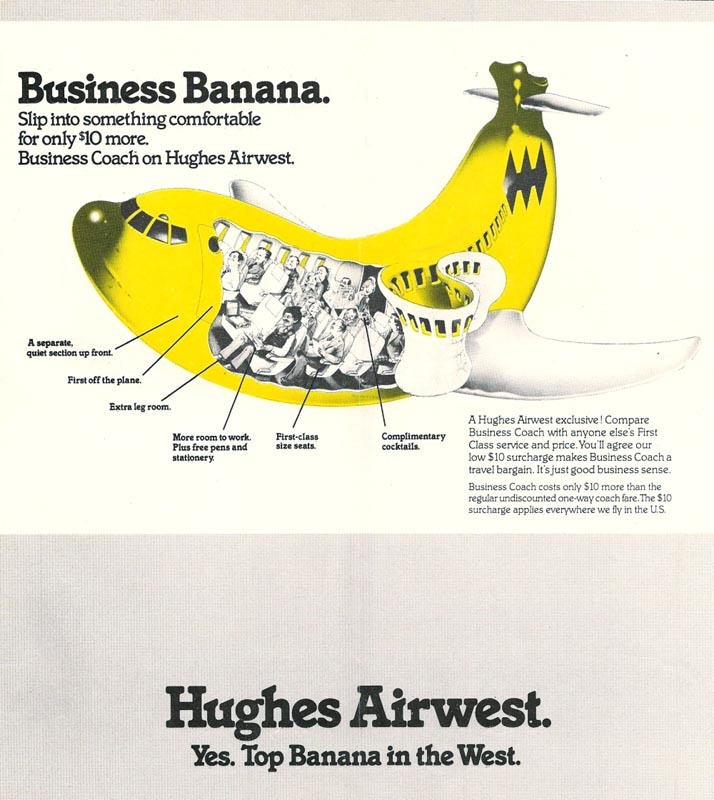 Forced out at TWA, Hughes again revolutionized airline marketing in the early 1970s as my career began by buying and renaming an airline as Hughes Airwest, known for its extremely bright yellow airplanes and “Top Banana”-themed marketing. Back in 1966, Hughes had visited Las Vegas for Thanksgiving a month before my maternal grandfather, Mark White, took me on a trip there. It was my high school graduation present, and we went to the newly opened Caesars Palace to see Johnny Mathis in concert. When after a few days, Hughes was asked to vacate for another guest who had reserved the room, he instead bought that hotel and then several others. In 1976 while I was marketing Spokane, he died, fittingly on a plane. By the last two decades of my career, you could scarcely find airline reps who thought of their product as anything other than transportation. Unfortunately, that meant they typically had little interest in the destinations they served even though those places were the reasons people flew at all. Having dropped destinations from their storytelling, most could not even tell the difference between a city and an airport name. A sign of how little they understood, they even charged community destination marketing executives for trips - at their request -to help generate traffic for a new route. Airlines today are commoditized, and grasping at add-on fees rather than storytelling or storydoing. It is going to take much more than a throw-back ad campaign for any airline to be much more than a commodity.